My daughter had asked me to knit a jumper for Milly, my granddaughter, and she wanted something that could be worn outside as an alternative to a coat. The advantage of a jumper is that it has no front-fastening buttons to come undone and I also knew that I’d need to knit something warm enough for outdoor wear and loose enough to enable Milly to wear a T-shirt underneath. So this is the jumper I knitted. The pattern I made up is so simple, as it consists mainly of rectangles and the sleeves are knitted by picking up stitches around the armholes and working down towards the cuff. 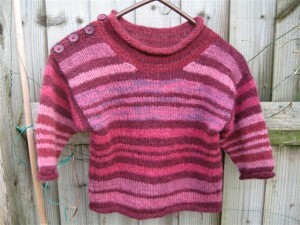 The shoulder-opening makes it easy to put on too and I hope my daughter and granddaughter will be pleased. The wool was dyed mainly in cochineal, with some indigo, and the shades blend in together beautifully. So many thanks to Leena for producing such lovely colours. One aim of this project was to produce blues from the leaves of Indigofera arrecta, an indigo-bearing plant which grows wild in the area around Rubona, where the project is based. For some time I have been in correspondence with the project leader, Rupert Kampmueller, offering advice to help him achieve this aim, and I was convinced that the methods used to extract indigo from fresh woad leaves could be adapted for use with this local source of indigo. This week I was very pleased to hear from Rupert that, after much trial and error, he has at last been successful in his attempts to produce deep blues from locally-harvested indigo leaves. Based on the methods I use for dyeing with fresh woad leaves, Rupert has developed suitable extraction and dyeing methods to enable the ladies in the Rubona group to produce a range of blues on raffia, using the leaves of locally-growing Indigofera arrecta. 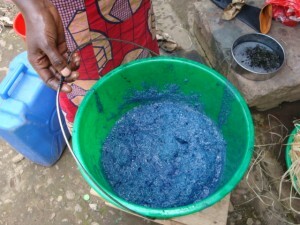 The next stage will be to see whether the method I use for storing woad solutions can also be used successfully with indigo solutions made from the leaves of these Ugandan plants. The following photos, supplied by Rupert, show some of the stages of production. 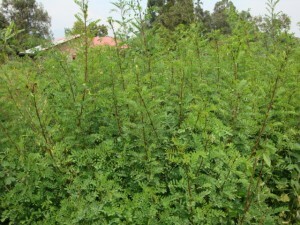 This photo shows Indigofera arrecta growing wild near Rubona. Following processes similar to those used with fresh woad leaves, leaves from these indigo-bearing plants are harvested and first steeped in very hot water. After an hour or so, the leaves are removed and soda ash is added to the liquid. Oxygen is then incorporated into the solution to precipitate the indigo particles. This shows the strained-off indigo solution being poured from one bucket to another to incorporate oxygen. This shows the froth containing the precipitated indigo pigment. 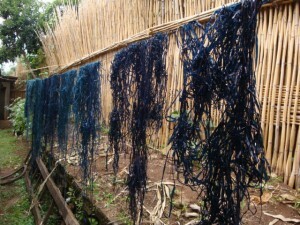 This shows the raffia dyed in the indigo vat made from the leaves of Indigofera arrecta. This successful use of local indigo plants is of great significance for the weavers of Rubona, as it means they now have a readily available source of blue and no longer need to rely on imported indigo. Once again, I send my most sincere thanks for all the kind messages I’ve received, following the announcement that “Wild Colour” will be revised and reprinted later this year. I really appreciate all the encouragement and support I’ve been given. I am delighted to be able to tell you that the publishers have agreed to reprint “Wild Colour” and revised editions will be published in both the UK and the US in September/October 2010. I shall be making changes to the text of some sections of the book but its appearance will be basically the same. I would like to thank most sincerely everyone who supported my efforts to secure this reprint and most particularly Mary Walker, who organised the Facebook page and kept the US publishers informed of the degree of interest in the book. Without Mary’s efforts, together with her encouragement and the support of so many people, I am sure this reprint would not be happening, so I am truly grateful to you all. Many, many thanks. All our Christmas decorations have been returned to their storage boxes and my thoughts now turn to the year that lies ahead. We have decided to start the year by “de-cluttering”. For us this is a truly daunting prospect, as we’ve lived in this house for over 32 years and have filled every available space, both inside the house and outside in the outbuildings, with “stuff”. This photo should give some idea of what I mean. I’m ashamed to say that this shows part of the inside of my workshop before I started to sort and clear out the boxes, shelves and tables. Originally this outbuilding was intended as my dyeing room, with a writing and reading area, but gradually every available surface became covered with items deposited “for the time being” until I got round to sorting them out and tidying them away. Needless to say, once I had established another dyeing area in our conservatory, this tidying up process somehow never happened – until I embarked on it this week, that is. 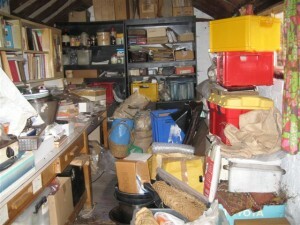 Sometimes sorting through the evidence of a lifetime of hoarding can be a refreshing and revitalising process. It certainly does feel good to bring some order into the chaos within drawers and cupboards, especially when one finds unexpected treasures that bring back happy memories. At the same time, I am amazed at my apparent inability to throw away such things as bent paper clips, dried-out pens, screwed-up paper bags or even the smallest piece of string. Gradually I am learning to separate the rubbish from the genuine treasures and I’m re-organising and labelling my storage spaces in the hope that I shall be able to find things more easily in future. Of course I am resolving never again to let things get so disorganised and untidy but I suspect I may all too quickly revert to my bad, old ways. However, with each bag of rubbish consigned to the council tip, I feel a lifting of the spirits, as if I am casting off aspects of the past that have been weighing me down. So I hope I shall be able to face 2010 with an increased sense of optimism and a readiness to embrace new experiences. If you are feeling somewhat jaded and lacking in enthusiasm at the start of another year, I can recommend the therapeutic value of a little sorting and tidying. However, whatever you are feeling, I wish you all the very best of health and happiness for 2010.